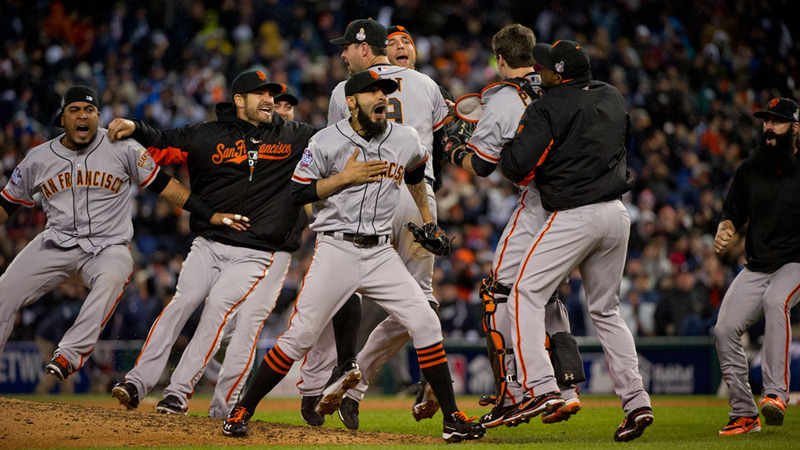 All signs pointed to a competitive 2012 Fall Classic between the Detroit Tigers and the San Francisco Giants. The Tigers were coming off a four-game sweep of the Yankees in the American League Championship Series and the Giants had won the National League pennant after being down, 3-1, to the Cardinals. In a familiar spot, the Giants found themselves back in the World Series for the second time in three years, beating the Rangers in five to win it all in '10. Detroit's World Series berth was its first since 2006, when it lost in five games to the Cardinals. Game 1 at AT&T Park set the stage for what would be a dominant series for Giants third baseman Pablo Sandoval. He joined Reggie Jackson, Babe Ruth and Albert Pujols as the only sluggers to hit three home runs in a World Series game. What made the feat even more unbelievable was that Tigers ace Justin Verlander issued two of them. While the right-hander lasted just four innings, Barry Zito was able to hold the Tigers scoreless until Triple Crown winner Miguel Cabrera's RBI single in the sixth. The Giants' bullpen, including Tim Lincecum, was able to hold down the lead after that and secure an 8-3 win. Far less offense was seen in Game 2, with the clubs combining for just seven hits. From the first pitch, Madison Bumgarner was locked in. The Giants left-hander shut down the Tigers for seven innings before the team played some small ball in the final few frames to eke out a 2-0 win. Gregor Blanco's single stopped just inches fair on the infield dirt, then he scored on a double-play grounder in the seventh. The Giants tacked on another run in the eighth on Hunter Pence's sacrifice fly. Right-hander Doug Fister was on the losing end, even though he allowed just one run on four hits in six innings of work. It was a gutsy performance for Fister, who stayed in the game after being hit by a line drive off the bat of Blanco in the second inning. The series moved to Detroit for Game 3 with the Giants up, 2-0. Pitching once again ruled supreme in a 2-0 win for the Giants. Ryan Vogelsong got the win and moved the Giants to within one win from a World Series championship. On a chilly night at Comerica Park, Vogelsong, along with Lincecum and closer Sergio Romo, blanked Detroit to help San Francisco become the first team to throw consecutive Series shutouts in nearly a half-century. It also marked the Tigers' first home loss in more than a month. San Francisco's two runs came in the second inning on an RBI triple by Blanco and an RBI single by Brandon Crawford. Unable to find any offensive continuity, the Tigers through three games totaled just three runs on 15 hits for a paltry .165 average. Down 3-0 to the Giants in the Fall Classic, Game 4 was a do-or-die situation for the Tigers. Things started off well for Detroit at home, holding a 2-1 lead after five innings. However, San Francisco scored two runs in the sixth on a clutch two-run home run by Buster Posey. The Tigers answered right back when Delmon Young belted a solo shot in the bottom half of the frame to tie the score at 3. Things would be decided in extra innings, when Marco Scutaro singled to center in the 10th inning to give the Giants a 4-3 lead and help them triumph over the Tigers. Sandoval, who hit three home runs in Game 1 and went 8-for-16 in the four games, was named the World Series MVP. It was the Giants' second championship in three years, and the sweep was the first by an NL team since the Reds swept the A's in the 1990 World Series.